The happy community lives in 15m2 mobile homes, sometimes self-built, a handful of kilometres away from big cities. Members of the 'Tiny House' movement are basically environmentalists rooting for "happy sobriety", a phenomenon that is gaining ground across Europe. Forget about reimagining houses of the future, tiny houses are already proof that alternative living exists. We met with members of the community lodged in the suburbs of Paris. 18 square metres. 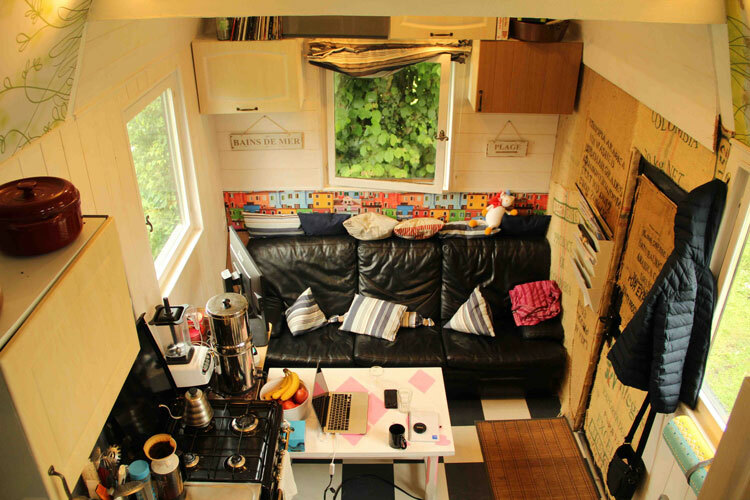 That's the size of the tiny house belonging to Sophie Di Domizio, a 30-year-old living in Eaubonne, a suburb outside Paris. It's small. But once inside, you can see that it's in no way lacking in comfort. Equipped with a living room, a kitchenette, a composting toilet, a mezzanine with a bedroom and bathroom, the space allows its young owner to benefit from all the functions and furnishings of a typical house. Having worked in construction engineering for seven years, Sophie knows what she's doing. Ironically, she began to think about small spaces while working on a building project for a large house. "At first, I wanted to build an enormous house on a plot of land. But when I thought about it, 250 square metres for myself... what was I going to do with all that space?" So when she came across an article on tiny houses, the young woman got straight to work and started designing plans for a small house in the woods that very night. Two weeks later, the construction began. Today, Sophie still has "two or three things that need tweaking" but everything is already there, placed on a trailer in the garden. Her micro house even has a name, Rosalie, in homage to a song by the French singer Carlos. If she baptised it, it's because Sophie built the house all by herself. In salvaging bits and pieces from construction sites, the former engineer created a tiny house in complete autonomy. The result of that hard work means she can enjoy a space of her own for an estimated construction cost of 11,000 euros. There is no way of knowing exactly how many people picked up a hammer and nails after the TV report on TF1 was broadcasted. Whatever it may be, the French tiny house community already has hundreds of thousands of members, all seduced by the ecological values and autonomy it offers. In 2018, it's no longer unusual to come across YouTube tutorials on "How to build your micro house" even if the concept is over 20 years old. In 1998, Englishwoman Sarah Susanka launched the 'Tiny' movement and dedicated a book to it. In the USA, in the early 2000s, Jay Shafer and Gregory Johnson popularised the concept of micro houses on wheels by founding the Small House Society. Then, in 2005, after Hurricane Katrina destroyed over 200,000 homes, the movement found its feet. And finally, 2008's mortgage crisis gave it a moral and practical legitimacy. When faced with the housing crisis and over-population in cities, taking refuge in small mobile spaces seems like an informed decision. In France, the movement may still be in its infancy, but it has millions of devotees across the world. Especially given that the "Tiny Movement" has jumped on the environmental wagon. 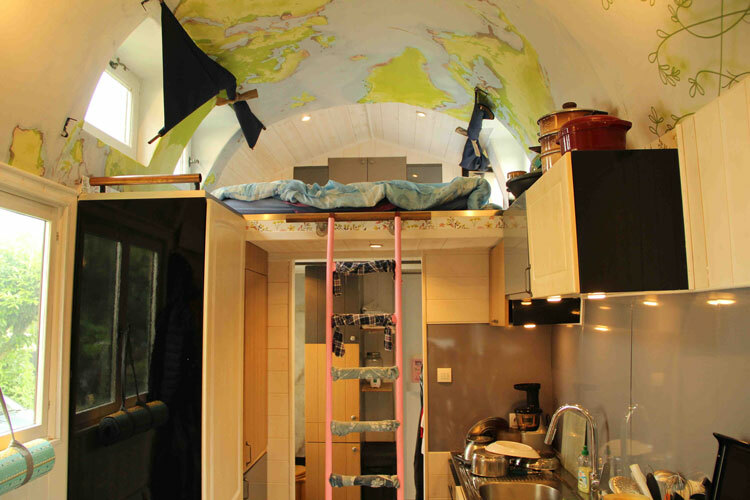 People like Veronica Padilla, the founder of the Tiny Movement, or Andrew Morisson, a builder with 200,000 views on YouTube, prove time and time again that living in small spaces does the planet a favour. And the message is getting through. On the 5th of May this year, the Earth reached its famous "Overshoot Day", marking the moment we have consumed more resources than the planet is capable of producing in a year. What this means is that, if the whole world lived like a European, we would need two extra planets in order to meet our needs. "Intelligent consumption" and "Think before you buy" have become clear leitmotifs for a majority of people. "You may say that a tiny house is only 18m2, but how many people live in Paris in an 18m2 space without this quality of life?" "Getting out of one's comfort zone." That's what made Sophie L. (a different Sophie, e.d.) decide to live in an 18 metre square trailer. This 30-year-old is still waiting to receive her tiny house, which she is having built by a specialist company. For our conversation, she agrees to meet me in a crêperie in a Parisian suburb. While I enjoy my cheese crêpe, she immediately notices something absurd: "The cone is made of plastic, it would be more environmentally-friendly to put real plates on the tables." Since she started preparing for life in a tiny house, Sophie L. worries about the smallest details that affect the environment. For example, she just threw away her large fridge to buy a smaller one. "I've started to think Tiny," she continues. Think Tiny? Saving her coffee grounds to put around her plants, pouring her pasta water on the plants rather than throwing it away, storing food in clay, using white vinegar to clean the house... According to Sophie L., living in a small space forces us to become more aware of the actions we need to take to help the environment. And that mindset has a domino effect. "Now my colleagues and parents pay more attention to certain things. But we can't just open people's eyes, we need to help them actually do something." Sophie L. didn't just wake up one bright morning and tell herself she was going to live in a tiny house. "To be honest, I had abandoned the idea several times," she confesses, "but it's something I had always dreamed about." For the librarian, it's all about experiencing the unknown: "When I went to Africa, I lived with close to nothing, only a few things in a tent, and I was very happy. A friend had shared some info on tiny houses with me and it seemed so logical." And everything became clear: "Our houses are full of things that we don't use and that we cannot part with, but consumer society forces us to buy things. It takes time but really, it's just a different way of life, one where you make the effort to buy less." Sophie L. is proud of her choice and believes she has no reason to envy other people: "You may say that a tiny house is only 18m2, but how many people live in Paris in an 18m2 space without this quality of life?" Beyond environmental concerns, living in tiny houses is part of a larger life philosophy, a doctrine that was particularly popularised in France by French agriculturalist, essayist and poet Pierre Rabhi in his book Vers la sobriété heureuse ("Towards happy sobriety", e.d.). The principle is living with less to live better. Speaking to Sophie L. is like preaching to someone who has already converted: "Our overconsumption is out of step with previous generations. Before, we had more common sense. Now, if we break something, we replace it. That means we're no longer resourceful, we don't know how to do anything anymore, we've lost skills, abilities, self-sufficiency." However, this clever Île-de-France inhabitant is aware of the fact that the impact of her plan is somewhat limited: "Small actions of one individual are great, but they are not going to change the face of the world because it's factories that consume the most and we don't have control. I know that most people are going to carry on as they have before and that my actions will not have a big impact, but it does me good to live like this. Once you start, you can't stop." Especially when the approach makes sense. Faced with the ongoing concerns about the environment, housing and jobs, living in a tiny house feels like a way to respond to the global upheaval in society. For Sophie L., having a tiny house built was the simplest way to respond to these demands: "It was exactly what I was looking for. I was tired of paying rent and I wanted to become a homeowner quickly, without having to pay a loan off for 25 years. When I leave, the main problem will be finding a job. And since I don't know anything about that yet, the advantage is that I can move the house without a problem if I no longer like the place I have chosen." Paula, who doesn't live in her tiny house but who rents it out to the curious on weekends, says the same: "These days, we are increasingly destined to move around, to be transferred, to look for work elsewhere. The job world is more complex than ever, we can easily see that fewer and fewer people are settled." For Sophie L., leaving the Paris area and giving herself the chance to be a nomad is the perfect way to fully live out her plan: "No longer being stationary and having a house I can move around gives me the feeling of being able to start another part of my life. It's quite frightening to say to yourself that life is comfortable and that it can stay that way. You have to get out of your comfort zone and discover other things." For Paula, living in a tiny house means changing your life without taking any big risks. These little houses are a response to a need for freedom. But above all, they bring a sense of reassurance: "You can tell yourself that you can move your house anywhere but you will also always have a sense of security. You still have comfort; you're a nomad but you haven't gone as far as hippies did, because you still have your belongings wherever you go. Basically, it's knowing how to take the good parts of society with you and leave the others behind." Since tiny houses seem to be the solution for all this century's woes, they could quickly become a widespread housing model for the world. In France, some organisations have been quick to exploit the potential of small buildings, especially to help the homeless or refugees. Quatorze's project In My Backyard is one example, along with La Manufacturette's project for asylum seekers called the Dome project. The two organisations found that tiny houses were a great way to promote cohabitation in Europe while at the same time reconciling with environmental demands. But there is still a long way to go. While the movement was imported by Anglo-Saxon countries, members of the tiny movement make up less than 1% of the population of each country in Europe. In Germany like in Spain, tiny houses are objects of open curiosity, nothing more. Even in the United Kingdom, where the concept was born, they have never been a subject of real debate in society. "We have enough trouble getting people to recycle let alone getting them to agree to this..."
In France, the initiative is also sorely lacking legislative framework, which could eventually ban those using tiny houses to install themselves where they want. "For town halls, the mobile aspect poses a problem," Paula explains. "They aren't familiar with the concept and there is a judicial vacuum on the subject because they don't know whether to classify it as a caravan, a mobile home or something else." Even if for the two Sophies, society is far from being ready to sacrifice its comfort for the planet: "If tomorrow you helped all those who live in unsanitary housing get a tiny house, they would jump at the opportunity. But people like businessmen who already live comfortable lives have no reason to do it," one of them suggests. "The concept of zero waste and of not having a rubbish bin already shocks people. As soon as you do something out of the ordinary, it's considered bizarre and we have enough trouble getting people to recycle let alone getting them to agree to this," the other rails. In the end, tiny houses are still an unusual habitat that people like to try out for a weekend, like at Paula's: "People come to discover it all really, because it's quirky. They want to see what it is and how to live inside. People leave enchanted, but I haven't had a guest tell me that they were going to have a go." And with the slam of a door: "They aren't ready yet."